I think the fact that Google is already on version 10 of its Chrome Browser, merits its own headline, but there’s something else to talk about regarding Google Chrome 10. The latest Google Chrome dev channel build has a special added feature. The release comes with preloaded with two HTML5 based games. Yes you heard right, two free games. The two games, Poppit and Entaglement, are nothing fancy. They’re just some small HTML5 based games. The plot behind Poppit, is to pop groups of like colored balloons. As you pop more and more groups, you earn prizes. Once all the prizes are collected, you win the game. Entanglement is a puzzle based game, its bit more complicated. There are hexagon based shapes on the playing board, and you have to connect pieces to create an unbroken line by laying down tiles next to each other. It’s something along those lines, I didn’t really play it that long. If you into reading Google’s source codes, you can see below, the two games are clearly listed in there. Anyways the games come bundled with the latest dev channel build Chrome 10.0.612.3. You can access the games by opening up a new tab page. 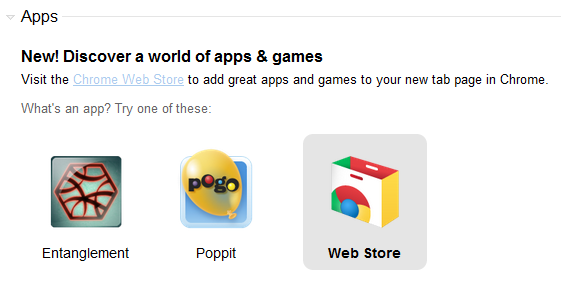 The games will be installed along side any other previous Chrome Web apps you have installed. If you decide that you don’t want them anymore, you must uninstall them manually. I’m not sure what to think of this, it seems kind of strange for Google to do something like this. They aren’t known for bloatware. I wonder if we will see more of this in future releases of Google Chrome and Chrome OS.